Neuchatel International Fantastic Film Festival (NIFFF) today announced a full programme of genre treats ahead of their July 6th start date. In addition to the previously announced world-first focus on genre films of New Zealand and the festival's highlighting of Swiss fantastic cinema, the festival presents a packed Competition, an exciting exploration of New Cinema from Asia, and a delve into the more extreme, unusual and innovative offerings the genre world has to offer with their Films of the 3rd Kind and Ultra Movies strands. Take a look at the full announcement below! The Neuchâtel International Fantastic Film Festival (8-14 July) is proud to reveal its official programme for the 18th edition, focused on highlighting the boldness of current productions. With David Cronenberg as President of the jury, the international competition will be composed of an overview of the most anticipated releases (UNDER THE SILVER LAKE from David Robert Mitchell, HEREDITARY from Ari Aster, MANDY from Panos Cosmatos), as well as first features from emerging talents (Tilman Singer’s LUZ, Rasmus Kloster Bro’s CUTTERHEAD, Justin P. Lange & Klemens Hufnagl’s THE DARK), and the best of auteur cinema in the fantasy genre (CLIMAX from Gaspar Noé, DIAMANTINO from Gabriel Alamantes & Daniel Schmidt, MUERE, MONSTRUO, MUERE from Alejandro Fadel). Daring experimental films will play alongside retrospectives and cartes blanches, to outline the history of genre cinema, notably with the CLASSICS RELOADED category, dedicated to restored version of renowned masterpieces screened at the Open Air. WHAT WE DO IN NEW ZEALAND, first-ever retrospective focused on Nez Zealand genre films, will take you to the other side of the world, and the EL DORADO section will make a comeback to pay homage to the limitless imagination of Latin American cinema. For its opening ceremony, the NIFFF will present the world premiere of the web series LE 5E CAVALIER, in collaboration with RTS. The Swiss premiere of HÔTEL TRANSYLVANIA 3 will conclude the festival on a quirky, funny, intergenerational note! 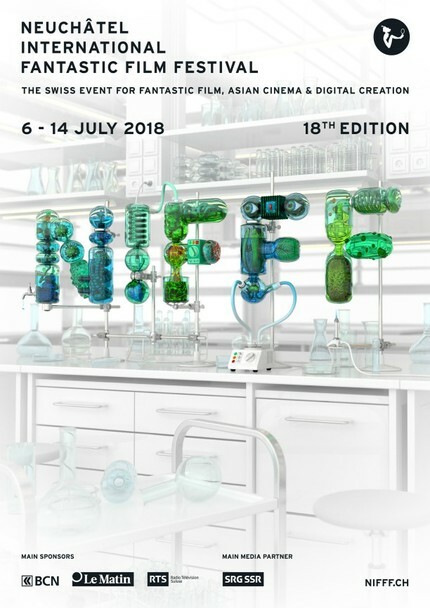 THE NIFFF’s 18th edition has a total budget of CHF 2’175’000. Lasting 9 days, it will show over 150 films from 14 sections. It can welcome 2’135 viewers at the same time. The 168 public screenings will be composed of 109 features and 60 shorts from 41 countries, including 7 world premieres, 6 international premieres, 9 European premieres, and 53 Swiss ones. The free NIFFF Extended and NIFFF Invasion programmes will offer more than 71 activities, 61 of which are conferences. Film genres intersect in this diverse selection of hybrid experiments and formally innovative movies. Prepare for an avalanche of Swiss premieres and prestigious guests: headstrong actress Halldóra Geirharðsdóttir from WOMEN AT WAR (SACD award at the International Critics' Week), Benedikt Erlingsson, screenmovies creator Timur Bekmambetov (and his film PROFILE), the adorable little (for the most part) monsters from MONSTER HUNT 2, and Frank Ribière, director of LA FEMME LA PLUS ASSASSINEE DU MONDE. Finally, Yannick Renier will be in attendance to present CARNIVORES, which he directed with his brother, and tells a story centred on the carnivorous relationship between two sisters who work in the film industry. Looking for thrills? The ULTRA MOVIES category will test your limits with the most extreme works of the year. Guests include actress Amanda Plummer (Pulp Fiction, Hunger Games), who will present the international premiere of A YOUNG MAN WITH HIGH POTENTIAL from Linus de Paoli, and BLOOD TEST director Owen Egerton, who will introduce his horror film festival-set gorefest... There will also be the European premiere of Colin Minihan’s latest gloomy film, WHAT KEEPS YOU ALIVE, in the presence of his two main actresses.